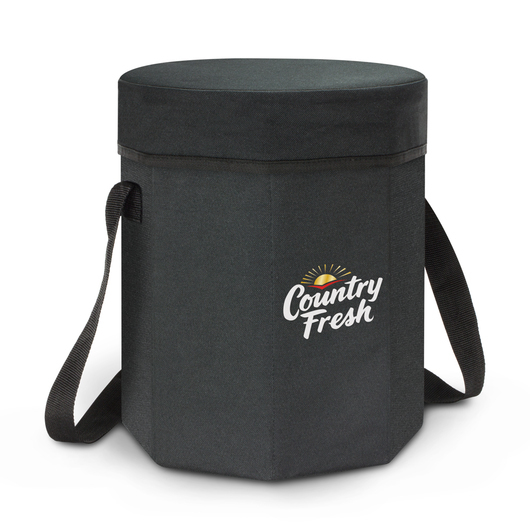 An 11 litre cooler bag that also functions as a seat. I'm sure most Australian's are already well aware with the concept of using an esky as an extra seat. Well these cooler bags expand on that concept and they're a lot easier to carry! Introducing the 11 litre capacity cooler bag which will hold 24 cans and can double as a seat and support up to 90kg. Made from 600D polyester with an inner lining of aluminium foil laminated PE foam insulation. These also have a removeable base allowing it to fold flat for compact storage when not in use. It can then be easily assembled in seconds, other features of the cooler include plywood reinforced walls, a soft padded seat, a zippered top closure and an adjustable woven shoulder strap.